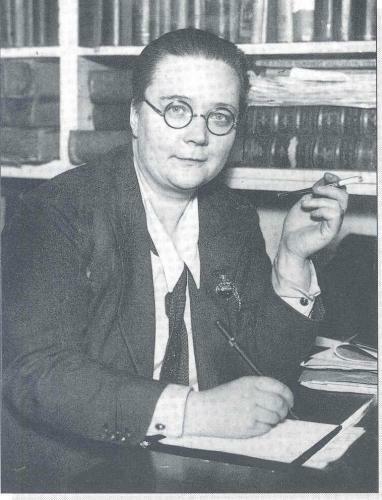 When most people hear of Dorothy Sayers (1893-1957), they probably more often think of her as one of the twentieth century’s great mystery writers, and not one of the many Wondrous Women of the Faith. She is, however, both. One of the things, in fact, that makes Sayers one of the Wondrous Women is the fact that she wrote mystery novels. I mean, this alone does not qualify one for a place in that illustrious group, but far too many Christians worthy of renown have led cloistered lives or were clergy. Not Sayers. She was a Christian in the real world writing detective fiction — and detective fiction of high calibre and literary worth, to boot! Of course, it’s not the detective fiction that really makes Sayers worthy of mention. Nor is it the fact that she was one of the first women to graduate from Oxford with a Master’s degree. Nor is it the fact that she was on friendly terms both with GK Chesterton and the Inklings. It is the fact that, alongside these factors, she was a devout Anglo-Catholic who believed that the Christian creed provided one with a framework for living and thinking that saves one from chaos. To this end, she wrote her book Creed or Chaos? as well as her series of radio dramas on the life of Christ called The Man Born to Be King. I’ve never read the former, but the latter is magnificent, from the Magi to the Resurrection. The characters of the biblical narrative come to life under her skillful writing. She puts magnificent dialogue into their mouths, dialogue that brings out the fullness of the events and their theological significance in a way that other fictionalised accounts of the life of our Lord and Saviour fail to do. Will You come and play with me, big Brother Christ? Peeping from the shadow with Your eyes like flame? Then suddenly, at my elbow, leap up, catch me, call my name? And how Joseph dwelt with Mary in the carpenter’s shop? Stalking through the corners where the last disquiet lingers? And be down in time for breakfast, big Brother Christ? Another aspect of her work is the translation for Penguin Classics of some of the great poetry of the Middle Ages: The Song of Roland and Dante’s Divine Comedy. At the time of her passing, her translation of Dante’s La Vita Nuova was underway, and another had to complete it in her stead. Her notes and introductions for Dante are magnificent and help the reader get into the story and its images, helping the reader see below the surface of Dante’s magnificent creation. And what lies beneath the surface? Christ and the great Faith that stretches from the Apostles to ourselves. This is what Dorothy Sayers presents to us, adorned in beauty. She gives us the Apostolic Faith, the Apostolic Truth, clothed in beauty and splendour. And it is a rich faith, a deep faith, a faith worth believing. The richness of the poetry she composed and translated gives this wondrous faith of ours greater texture and believability than any of the apologetics produced by any of her contemporaries. One could argue, in fact, that this is exactly what Anglo-Catholicism is for — the clothing of the deep, abiding truths of Christianity in beauty, splendour, and light, drawing us common people into the mystery of the love of Christ, a mystery sometimes shrouded in the smoke of incense, often touched with a great intimacy. So the next time you check out Lord Peter Wimsey, ask also if they have a copy of The Man Born to Be King available. It is well worth a read.